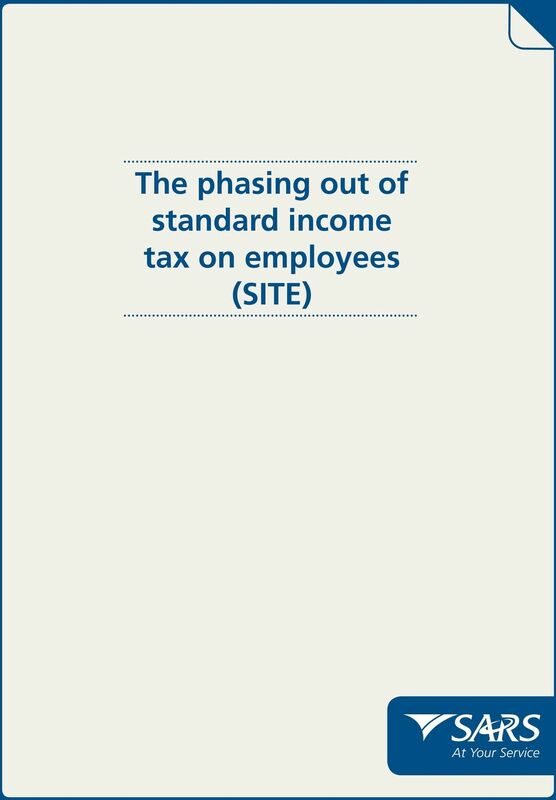 Download "The phasing out of standard income tax on employees (SITE)"
3 For the 2013 year of assessment: Age Tax threshold Below 65 years of age R Over 65 and below 75 of age R Over 75 of age R The changes explained The SITE system is now being phased out because the tax collection system has been modernised and administrative processes improved over the years which enables the South African Revenue Service (SARS) to quickly and effectively process a taxpayer s submission to SARS. 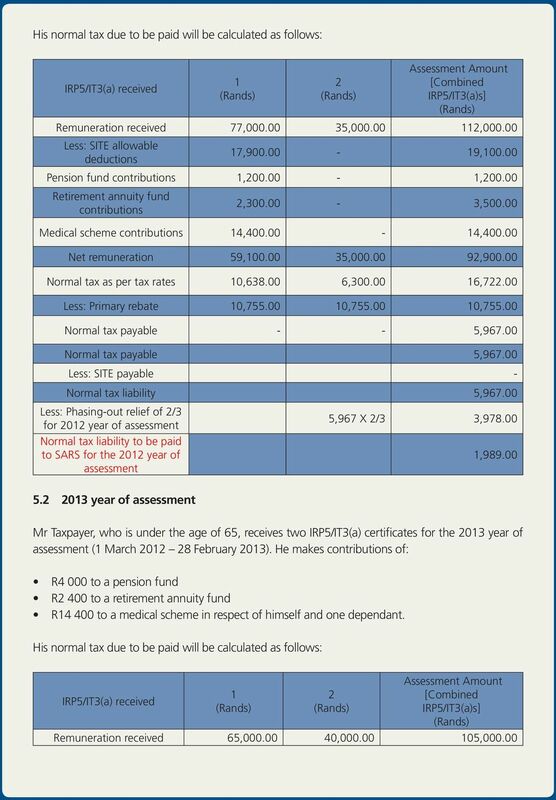 Furthermore, the Income Tax threshold (R for the 2012 year of assessment), for taxpayers younger than 65 years of age, is approaching the SITE limit of R To ease the impact on affected taxpayers (who now have to submit an Income Tax Return), a phasing-out process over the next two years of assessment has been introduced. Administrative relief measures are provided for to limit any potential hardship to affected taxpayers. Taxpayers who received more than one IRP5/IT3(a), from which only SITE (source code 4101) has been deducted, will now be liable to pay Income Tax for the first time on their combined income. 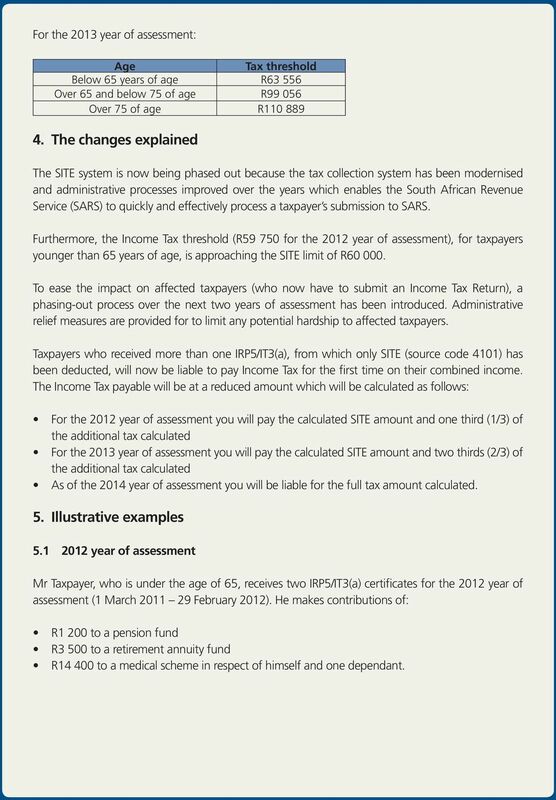 The Income Tax payable will be at a reduced amount which will be calculated as follows: For the 2012 year of assessment you will pay the calculated SITE amount and one third (1/3) of the additional tax calculated For the 2013 year of assessment you will pay the calculated SITE amount and two thirds (2/3) of the additional tax calculated As of the 2014 year of assessment you will be liable for the full tax amount calculated. 5. Illustrative examples year of assessment Mr Taxpayer, who is under the age of 65, receives two IRP5/IT3(a) certificates for the 2012 year of assessment (1 March February 2012). He makes contributions of: R1 200 to a pension fund R3 500 to a retirement annuity fund R to a medical scheme in respect of himself and one dependant. 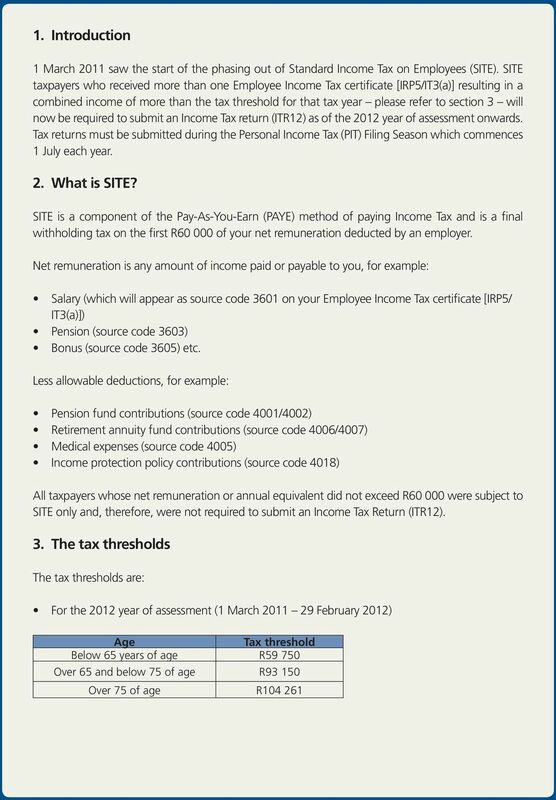 5 Less: SITE allowable deductions 5, , Pension fund contributions 4, , Retirement annuity fund contributions 1, , Net remuneration 59, , , Normal tax as per tax rates 10, , , Less: Primary rebate 11, , , Normal tax payable - before medical tax credit Less: Medical tax credit - available R5520 Normal tax payable after medical tax credit - - 6, , Normal tax payable Less: SITE payable (not applicable in 2013 tax year) Normal tax liability Less: Phasing-out relief of 1/3 for 2013 year of assessment Normal tax liability to be paid to SARS for the 2013 year of assessment 788 X 1/ year of assessment Mr A Taxpayer will be liable for the full tax payable amount in the 2014 year of assessment (1 March February 2014) and no phasing out relief will be granted. 6. How do I obtain an Income Tax Return (ITR12)? 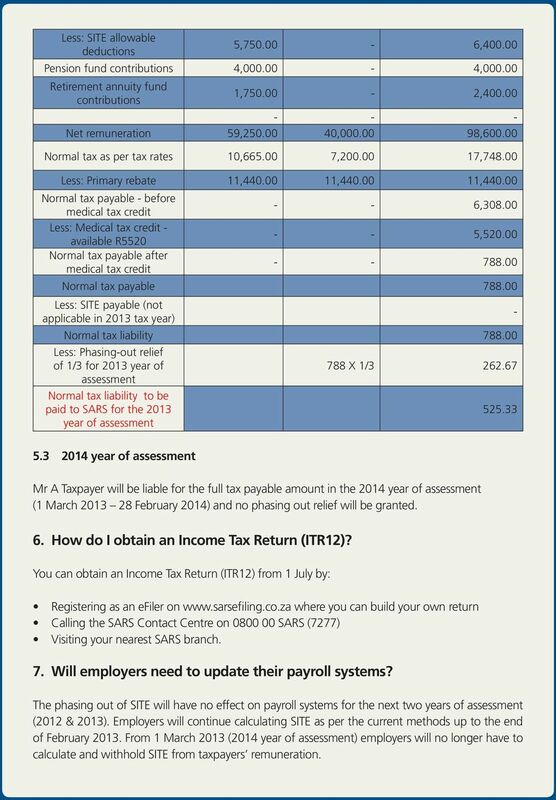 You can obtain an Income Tax Return (ITR12) from 1 July by: Registering as an efiler on where you can build your own return Calling the SARS Contact Centre on SARS (7277) Visiting your nearest SARS branch. 7. Will employers need to update their payroll systems? The phasing out of SITE will have no effect on payroll systems for the next two years of assessment (2012 & 2013). Employers will continue calculating SITE as per the current methods up to the end of February From 1 March 2013 (2014 year of assessment) employers will no longer have to calculate and withhold SITE from taxpayers remuneration. 6 8. More information For more information visit the SARS website call the SARS Contact Centre on SARS (7277), or visit your nearest SARS branch. Disclaimer The information contained in this leaflet is intended as a guide only and is not considered to be a legal reference, nor is it a binding ruling. The information does not take the place of legislation and readers who are in doubt regarding any aspect of the information displayed in the leaflet should refer to the relevant legislation, or seek a formal opinion from a suitably qualified individual. 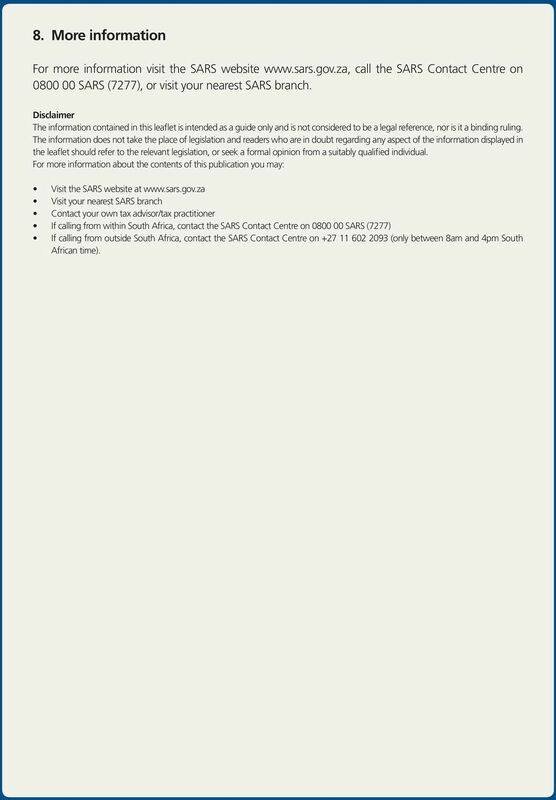 For more information about the contents of this publication you may: Visit the SARS website at Visit your nearest SARS branch Contact your own tax advisor/tax practitioner If calling from within South Africa, contact the SARS Contact Centre on SARS (7277) If calling from outside South Africa, contact the SARS Contact Centre on (only between 8am and 4pm South African time). STEP 1: REGISTRATION FOR efiling ITR12 QUICK GUIDE HOW TO efile YOUR INCOME TAX RETURN (ITR12) 1. NEW USERS You will need to register as an efiler before you can file your income tax return electronically. Pensions Freedom. What do the pension changes really mean? This is for information purposes only. Business Retirement Plan Matrix ELIGIBLE EMPLOYERS ELIGIBLE EMPLOYEES ADVANTAGES (for Plan Owner) 100 or fewer employees earning $5000 or more. Governmental and tax-exempt employers allowed. Any size employer. 3 Termination. 3.1 When has a member terminated employment from the pension plan? 3. 3.2 Termination benefit eligibility 6. 3. Pensions Technical factsheet June 2014 For financial advisers only Claiming tax relief on personal s This communication is for financial advisers only. It mustn t be distributed to, or relied on by, customers.